Our instructors come from SDWS's education committee. In addition to teaching beginner classes, they volunteer their time to teach art classes to all ages - in schools, after school programs and senior centers. As well as being active members of SDWS, many of our instructors are credentialed school teachers who have recently retired or are in between teaching positions. 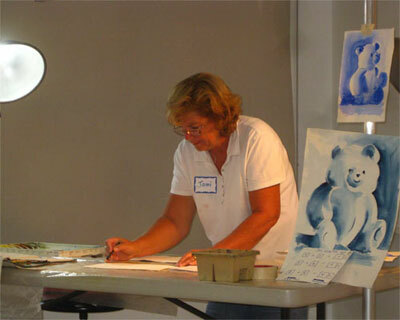 Throughout the day of the second class, our instructor gives a variety of demonstrations on value and color mixing which are immediately followed by hands-on student practice. 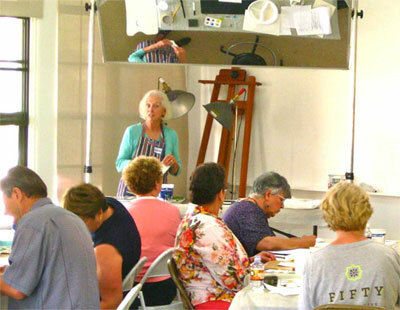 After the Beginner Basics class, the next classes will begin with a review of key watercolor techniques and then focus on a specific topic. These additional class topics are: Color and Value, Drawing for Watercolor, The Still Life-Bringing It All Together, Landscapes and finally, Mixed Media. 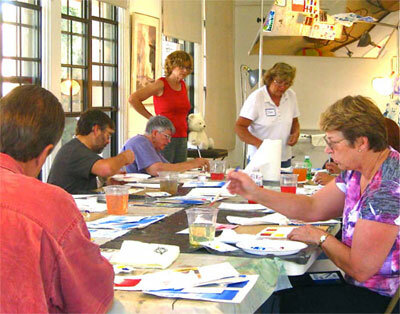 All classes are held in the gallery's education center. From here we hope new students will enjoy this new creative outlet and then join our membership by taking other workshops taught by a variety of professional instructors from across the country and from our own membership. painting techniques like flat washes, graded washes, dry brush and wet-into-wet. Remember, Rome was not built in a day. Every great artist started somewhere. Make your start here!